When it comes to souvenirs, there’s nothing scarier than those silver tourist teaspoons with a picture on the end… Put those away quietly and take out something still very Australian and much more beautiful: a pair of Alperstein socks. 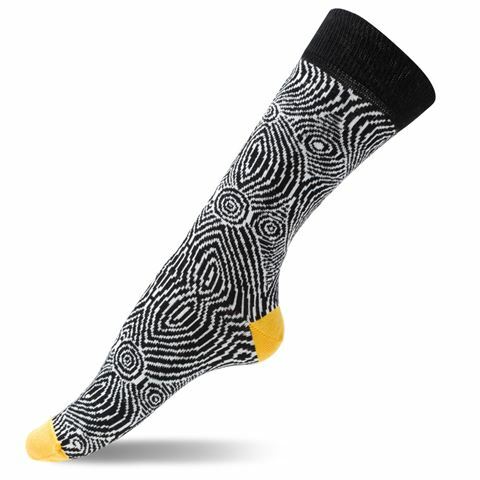 Adorn your feet with a pair of soft cotton socks decorated with Aboriginal artist Pauline Gallagher’s ‘Mina Mina Jukurrpa (Mina Mina Dreaming). Celebrate Australia's indigenous cultural heritage with wearable art, the perfect accessory for art lovers on the go. Based on an artwork by Pauline Gallagher.